On Tuesday, Leonardo DiCaprio contributed $1 million toward efforts to save tigers from extinction as he arrived in Moscow to take part in an international "tiger summit." The star of movies "Titanic" and "Inception" made the $1 million commitment to the World Wildlife Fund (WWF), with whom he has been working this year on the Save Tigers Now campaign. DiCaprio, 36, is a dedicated environmentalist and a WWF board member who recently visited Nepal and Bhutan and toured a tiger habitat by elephant with an anti-poaching staff. Representatives from the 13 countries where tigers live in the wild have signed a declaration with the aim of saving the iconic big cats from extinction. The accord signed Monday stipulates the nations will strive to double the world's tiger population by 2022. They will also preserve and enhance their habitats and crack down on poaching and illicit trade in tiger pelts and body parts. The number of tigers has plunged some 95% over the past century. The 3,200 remaining tigers are under threat from poachers and habitat loss. 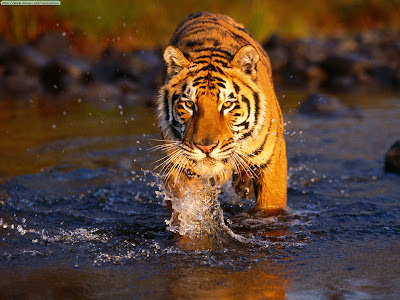 Many of the countries with tigers, such as Laos, Bangladesh and Nepal are impoverished. Saving tigers may depend on sizable donations. Russia is home to Siberian tigers. Russian Prime Minister Vladimir Putin hosted the "tiger summit."